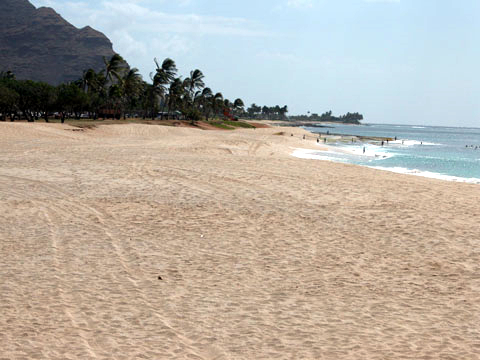 Ma’ili Beach Park, named for the town of Ma’ili, is a long, narrow, 40-acre park that borders Farrington Highway. Ma’ili is a contracted form of the word Ma’ili’ili, or “lots of little pebbles.” ‘Ili’ili are small, rounded, water-worn stones that are familiar to most people today as percussion instruments used by hula dancers. The long sand beach that fronts the park experiences seasonal erosion and accretion. Rocky shelves line much of the shore at the water’s edge. The popular surf site Green Lanterns is located at the mouth of Ma’ili’ili Stream. A jetty constructed in August 1966 as part of a major improvement to the stream channel intrudes into the surf site, but not enough to ruin it completely. Tumbleland, another surf site on the long beach, is in the center of the park. The entire beach is subject to strong currents during periods of high surf.